“Riddle me this,” wrote editor Dave Cameron to me some time ago, “what happens when an unstoppable force meets an immovable object?” OK, that’s not exactly how it went down. What he actually did was to present me with the challenge of research, with the goal being to develop a model that would forecast the expected odds of an outcome of each match-up between a specific batter and a specific pitcher. Rather than talking about how players have done in small samples, can we use our understanding of player skillsets to develop an expected outcome matrix for each at-bat? For example, such a tool might tell you that Adam Dunn has a 40% chance of striking out against Stephen Strasburg, a 10% chance of drawing a walk, a 5% chance of hitting a ground ball, etc… Forget I said those particular numbers — I completely made them up in my head just now. You may be thinking “well, why should I care about that? Rather than just being inundated with match-up data that is little more than randomness, such a tool might give you some idea of how much of a gain in expected strikeout rate a team would get by switching relief pitchers with a man on third base and less than two out. Or what the probability of getting a ground ball is in a double play situation, which might influence the decision of whether or not to bunt. Knowing the odds of potential outcomes could be quite beneficial in understanding the risks and rewards of various in-game decisions. This project has been — and will continue to be — a major undertaking, as you can imagine. This isn’t the kind of thing that can just be thrown together, but I really think the results could be great. Today, I’ll be sharing with you the findings of my research into perhaps the most important aspect of these matchups — K%, or strikeouts per plate appearance. This will introduce the sort of process that will be involved in figuring out all of the other elements of the matchup tool. Now, I think it’s common sense that when you match up a batter who strikes out a lot against a pitcher who whiffs a lot of batters, the batter will probably strike out at a very high rate. Conversely, a batter who rarely strikes out will likely strike out even less against a “pitch to contact” hurler. But what happens when a high-K batter faces an equally low-K pitcher? The unstoppably-swinging bat against the barely-moving pitch, you might say. Is the resulting K% average, above average, or below average? Does the batter or the pitcher exert more influence on the results? And can the results even be predicted? There’s only one way to be sure — look at a ton of data. And a ton of data I did look at — over 1.5 million plate appearances, all told. Alright, my computer did most of the looking for me, to give credit where it’s due. The data set was play-by-play data from 2002 through 2012. Originally, there were close to 2 million PAs, but many were thrown out because they involved a non-qualifying pitcher or batter. What made a player “qualify” for consideration here? Well, first of all, the analysis does take into account the handedness of both the batter and pitcher in each PA. If a particular PA involved a left-handed batter (LHB) against a right-handed pitcher (RHP), then what I did was to analyze the results of the PA through the lenses of the batter’s historical K% against RHP and the pitcher’s historical K% against LHB. By “historical,” I mean their average over the entirety of 2002-2012. Now, I’ll understand if some of you take issue with that, because players don’t necessarily stay the same player for [up to] 11 seasons, but hopefully you’ll understand what I mean when I say that a big part of why I did that was to keep things from getting too incestuous. There’s some circularity going on here, when you think about it, as the PA makes up part of the history I’m drawing from; better to make that PA a very small part of the history, I say. Anyway, to qualify for consideration, a pitcher needed at least 600 PA against the handedness of the batter in question, and a batter needed at least 300 PA against the handedness of pitcher in question. Admittedly, they’re mainly arbitrary cutoffs, but the reasoning behind them has to do with stability, as well as the rarity of LHP relative to LHB (especially when you include switch-hitters). Since looking at every possible combination of K% down to two decimal places (e.g. 7.64% K batters vs. 21.39% K pitchers) would make things very unwieldy, what I did was to round every player’s historical numbers off to the nearest percent. I then looked at all the different pitcher-batter combinations in range, now that they were manageable. I found, for example, 9,536 plate appearances that involved a batter with around a 15% K rate and a pitcher with an approximate 13% K rate. 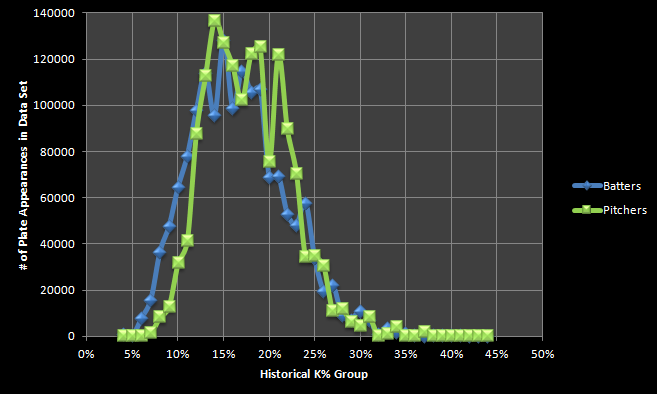 Out of these PAs, 998 of them resulted in a K, which means the observed K% for a 15% vs. 13% matchup was about 10.5%. “But wait,” you might be thinking, “why would the resulting K% be lower than either of the individual rates?” Well, for one thing, the league average K% over the period was 17.5%. That means that the batters in this scenario have established their 15% K rates against pitchers who are, on average, better at striking batters out than these 13% K pitchers. It also means that these 13% K pitchers are used to seeing batters who are a little bit easier to strike out. The net result is that this group of pitchers has a harder time, while the hitters have an easier time than usual, hence the particularly low resulting K% for this matchup. 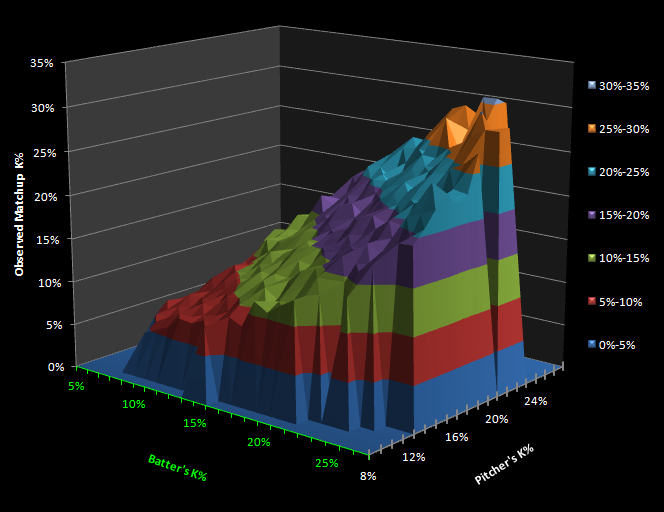 As you can see, it’s not quite a bell curve (a.k.a. normal distribution), but is skewed a bit, such that there are more PAs to the right of the peaks than to the left (“positive skew”). That’s to be expected, seeing as how 0% is as low as you can possibly go. That 25-25 matchup result is a bit of an outlier, by the way (31% would be more in-line with what surrounds it). It’s based on only 759 PAs, compared with 10,704 PAs for the 15-15 matchup, for example, though. There just are fewer batters and pitchers who strike out or get struck out 25% of the time. The results towards the extremes are therefore going to be less reliable. That’s why for the next chart, I only considered matchups with at least 1200 PAs to represent them. 309 matchup types made that cut, by the way. So, that’s looking at it so that the Batter’s K% axis and Pitcher’s K% axis are both angled 45 degrees from facing directly towards you, which mean you’re seeing a balanced view of the two of them. And what do we see? It’s pretty danged close to a straight line that the top surface is making here. 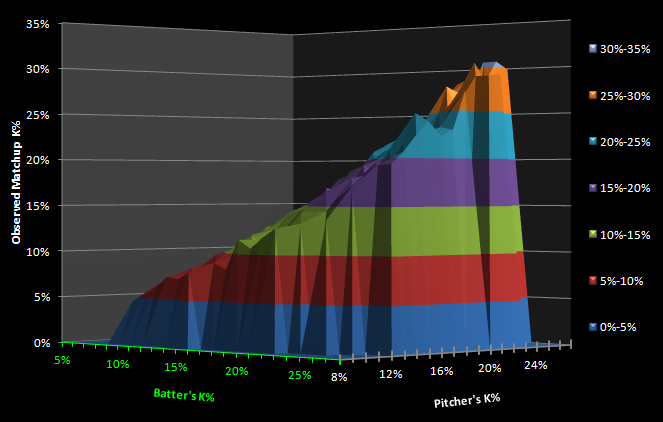 It bulges out a bit towards the top (in the high K% areas), but that’s to be expected due to the relatively fewer PAs being represented there. 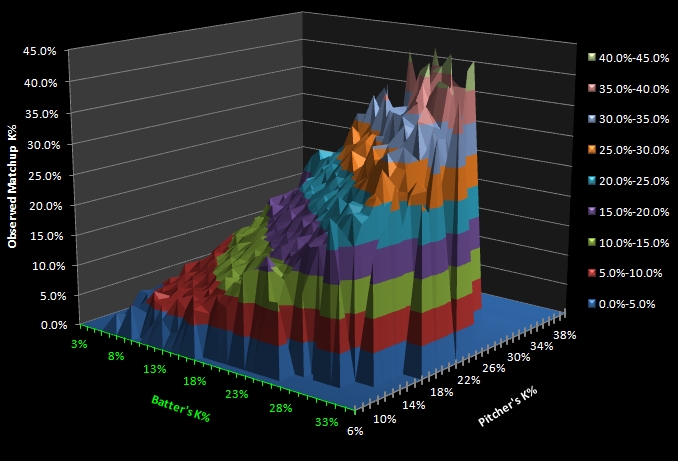 The peaks are higher, but the valleys are lower in the high K% areas due to more randomness, is what I’m saying. It looks more random, as expected, but I’d say the pattern still holds up very well. To me, the findings suggest that there is a very strong trend at work here, and probably a good amount of predictability, at least in the overall sense. When it comes to particular players, sure, there might be some batters with a particular weakness against a filthy curve, or a blazing fastball. Making those sorts of adjustments might come in a later incarnation of the matchup tool, but for now, I think this gives us a pretty solid baseline to work off of. As you can see, the batter and pitcher contribute equally to the outcome in this formula. In the next installment, I’ll show you that the formula (and a slightly more fine-tuned variation of it) does a pretty good job of explaining the trends in the data. One of these formulas (or something like them) will probably be the basis of the K% aspect of the matchup tool. I’ll also provide you with a better look at the data, for those interested, as well as an expected matchup K% calculator. We’ll even see how well we can predict the results of 2013 matchups based on past data. We hoped you liked reading Better Match-Up Data: Forecasting Strikeout Rate by Steve Staude! I’ve often thought about matchups this way (type of hitter vs type of pitcher), so I’m happy to see someone taking this project on. My one complaint is that I would have liked to see the ratios built from 2002-2011 and tested on 2012. I know you plan to do it with 2013, but it’s a little better practice to show something like this working when you present it. That’s probably the academic in me talking, but I love where this is going. Neil — yeah, I’m also wishing I’d done that, but the 2013 results look good regardless. And you’ll probably be seeing those in a day or two.